Ah, I've been waiting for this one. 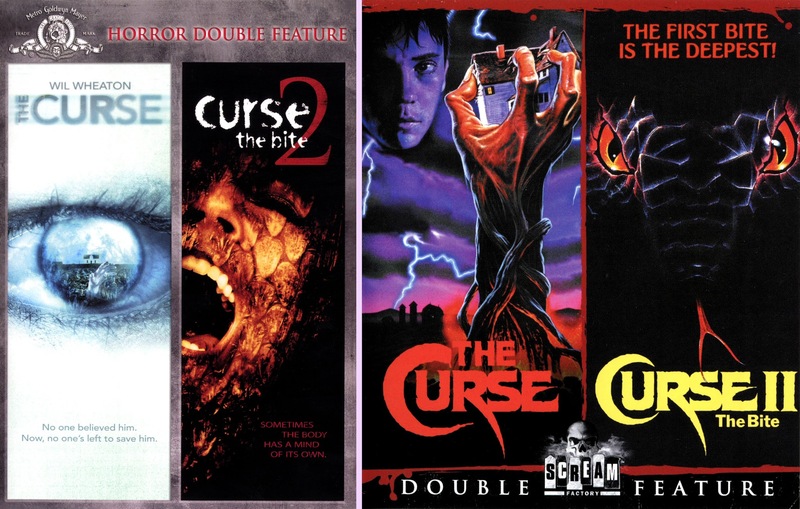 Anxious and hopeful, I knew The Curse and its sequel Curse 2: The Bite weren't high profile titles for Scream, and weren't being given collectors' editions. But hopefully they were going to do the film right, as both films have had a very troubled history on home video. Cropped, cut versions, misframed versions. Scream Factory's stats on their website looked promising, but I've also learned not to trust those. So when their brand new blu-ray double feature arrived, I opened it with a little trepidation. Of course, the filmmakers would surely want us delving into The Curse with some trepidation, just for a different set of reasons. It's a pretty creepy, character-driven horror story based on The Colour Out of Space by H.P. Lovecraft. Star Trek's Wil Wheaton stars as a young boy growing up on a farm with an a rather strict and unpleasant family. One night, Invaders From Mars like, he wakes up hearing the sound of a crashing meteorite outside of his bedroom window. But rather than bearing little green men, all this meteorite does is contaminate the local water supply. That's bad enough, though, as it goes from spoiling their food to making them sick, physically and mentally, until they eventually turn into deranged murderers. This is a surprisingly good, ambitious little movie. It's directed by actor Keith David who manages to get some very memorable performances out of his cast, and makes sure that the heavier-handed characters who might've seem one-note at first, get humanized and relatable. But it's also produced by The Visitor's Ovidio Assonitis who knows how to keep an 80s horror film popping. He even brought Lucio Fulci in to help make sure the effects scenes were, well, Fulci-like. Imagine one of his films but with strong un-dubbed performances and logical writing based on strong source material. Sign me up for that! Of course, it's not quite as ideal as all that... some of the supporting characters are pretty goofy, and the plot's trying to juggle one or two more elements than it can handle. But it mostly works. It's the kind of movie where people my age saw it once on cable as kids and are still a little bit haunted by it. By the way, fans of this film may be wondering about the sped-up scene. If you don't know, there's one point on the DVD - the cellar kill - where the frame rate increases substantially, and looks like some kind of weird error. Think Keystones Cops. Now, I've read that it might've originally been a slow motion scene, and it got sped up at some point, possibly by the distributors, to "fix it." But that was just speculation in an online forum, so I don't know. It's weird. I mean, maybe that's how the scene is supposed to be, an artistic choice decided by the director. But that just doesn't feel likely. Anyway, my point is just to let you know that, yes, it's sped up like that on the blu-ray, too. Curse 2, on the other hand, is more of a breezy b-movie. It's a sequel in name only, and I suppose in a loose conceptual sense. Far less ambitious, and it takes a long time to get rolling, but it's amusing enough if you don't ask a lot from it. Produced again by Assonitis, The Bite tells the story of Jill Schoelen and her boyfriend on a long road trip to Albuquerque. When the guy gets bit by a snake, a friendly traveling salesman played by MASH's Jamie Farr helps them out with a snakebite kit. But after they part, he realizes he gave them the wrong antidote and feels compelled to track them across country to correct his mistake. But things are a lot worse than everybody suspects, because it turns out that snake was radioactive, and it's turning Jill's boyfriend's hand into a killer snake with a mind of its own! If it felt like my description took a long time to get to the point (a guy gets a killer snake hand! ), you have a sense of what watching this movie is like. Lots of driving, rest stops, inconsequential dialogue. Jamie Farr spruces things up a little with some humor, but not too much. Once this film finally gets into gear, it's still a bit hollow and dumb, but it gets fairly entertaining. Screaming Mad George concocts some cool effects sequences, and things get a little crazy by the ending. It's one of those fun-to-catch-on-TV or good-way-to-kill-90-minutes kind of flicks. I wouldn't expect many people to bother buying it on blu-ray by itself, but as a bonus second feature with the original film, you'll be happy to have it. These were both staple VHS horror tapes back in the day, but they didn't hit DVD until 2007 when MGM rounded them up for a double feature flipper disc. 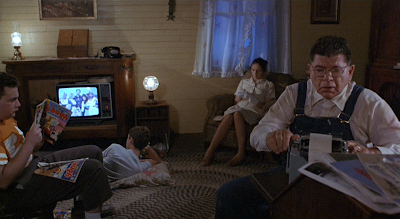 It was an improvement over the past tapes, in that The Curse had an ending sequence often cut off the film, and it was presented in widescreen. And they managed to include the unrated version of Curse 2, which had been released on both R and unrated tape back in the day. But that DVD still left a lot to be desired, as you'll see. 2007 MGM DVD on top; 2016 Scream Factory blu-ray below. 2007 MGM DVD left; 2016 Scream Factory blu-ray right. The blu-ray image is much more vivid and attractive. Not that it's loaded with more detail, as you can see in the close-up above; but it's a lot clearer. The HD really cleans up the DVD's compression. But most importantly, the film's finally 2.35:1. Yeah, MGM's DVD was The Curse's widescreen debut, but they framed it at 1.85:1. 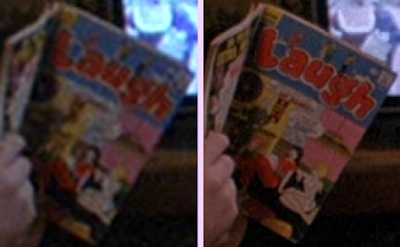 The result is the blu has a good deal more picture on the left, while the DVD is slightly more open matte vertically. Watching the film all the way through, you can tell the blu is correct; things are sometimes awkwardly cropped on the left-hand side of the DVD. The DVD had Dolby stereo audio, plus a Spanish dub, as well as English, Spanish and French subtitles. The blu has a new DTS-HD audio track, though it ditches the foreign translations. It does have optional English subs, though. MGM gave even less of an effort on Curse 2, so it's an even bigger improvement. They basically just ported the video tape transfer with full-frame 1.31:1 framing, soft details and bleeding colors. It's got some extra vertical info, but it's missing practically half the image on the sides. Seeing this film for the first time in 2.35, it actually raises my estimation of the film a little bit. That said, this doesn't look quite as good as Curse 1. As the film begins, we're shown a disclaimer telling us that this was taken from "the only remaining film element in the MGM vault - a film print." So it has a more contrasty image, and some pretty crushed looking blacks... though the DVD doesn't show much more in those shadows either. And the daylight scenes look better. So Scream's blu is leagues above the cruddy DVD and by far the best we've ever seen the film. Audio options are more limited here, too. The DVD just has an English Dolby Digital track, with optional English, Spanish and French subs. And the blu has another DTS-HD track and optional English subs. Extras-wise, things are a little less impressive. Even knowing in advance these weren't Collectors' Editions, I was quietly holding out hope we'd at least get a little on-camera interview with Assonitis or David to answer all the many questions we have about these films (which scenes did Fulci work on? What's with the sped up scene?). The MGM DVD was entirely barebones too, though, so technically the new blu tops it, because they at least managed to track down the trailer for the first film. That's new at least. But Wheaton's right there on twitter, I hope someone from Scream at least DM'd him. Still trailer > no trailer. Progress! So I hope me fussing over the details didn't give the impression that I'm not very pleased with this release. I bought this without waiting for any reviews (so I could write mine, natch), just hoping but not really believing this wouldn't be just an HD port of the DVD. And it isn't! They've fixed both films, and they look terrific. This is the only way you should be watching these films now, and if you're a horror fan, you should at least be watching the first one. And you'll get a kick out of the sequel. Recommended! Can you confirm if 'ths curse 2' edition on the blu is still the uncut version. Hi. I am pretty sure it is. Curse 2 on the blu is exactly 1.37.45, and it's 1.37.48 (with an extra TWE company logo at the beginning) on the DVD. However, I've never actually seen the R-rated cut and haven't been able to find any definitive sources on just what makes the two cuts different. So I don't really have anything to check it against. 97 minutes is also the listed runtime on the back of both the R and unrated VHS boxes, which doesn't help. So if you or anyone else reading this knows any tell tale moments to check for I definitely will, but as it is now, I'm pretty sure it's the unrated.